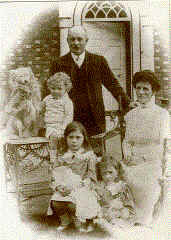 Due to someone taking the trouble to contact me on the death of their aunt, Dorothy Alice Parkes, I have been given both old pictures and some records of the Higham family that lived here at the end of the 1800's. The photographs on the next pages will take several minutes to load! 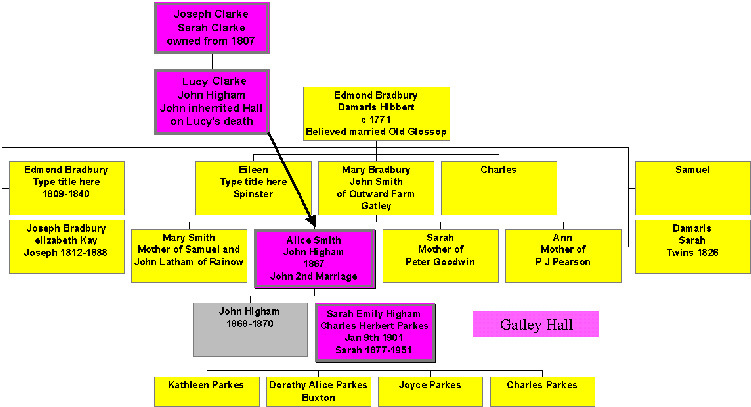 Initially this page gives a little information on the wedding and the Parkes family tree. the information centres around the wedding of Sarah Emily Higham (whose farther presumably John Higham owned Gatley Hall), to Charles Herbert Jan 9th 1901. 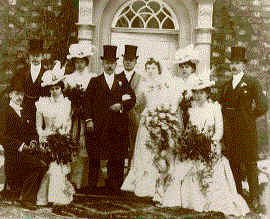 Parkes- Higham on Jan 9th, at Cheadle Congregational Church, by the Rev J. Weston Paull MA, assisted by the Rev W. Collett (Stockport), Charles Herbert, son of the late Alfred Parkes, J.P. Stockport, to Sarah Emily , daughter of the late John Higham, of Gatley Hall Cheadle. At Home, Gatley Hall, Febuary 6th and 7th. So John Higham had died and passed Gatley Hall on by then. Gatley Hall, in Old Hall Road, was kept by a Mr. Parks who had a iron foundry in Stockport, "Parks and Nephew". During the 1914-1918 war they used to give the lads in Gatley tuppence per hundred for tram tickets off the trams to help the war effort. That was when the trams ran from Reddish to Gatley. I remember peacocks at Gatley Hall, they used to come out onto the road!